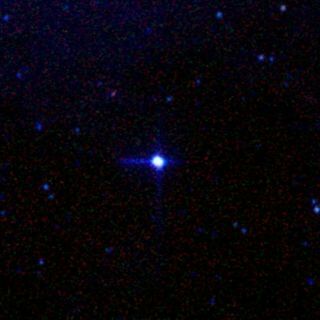 A photo of Alpha Centauri. Turbulent binary star systems, such as our closest stellarneighbor, Alpha Centauri, could host Earth-sized planets, new computer modelingindicates. Scientists have so far been unsure whether planets couldform amid the chaotic gravitational tug-of-war between two binary stars. Somerecent studies have suggested they could, but these projects have focused onmodeling the final stage of planet formation. Now researchers have probedwhether or not the necessary precursor to planet formation ? a so-called"protoplanetary" disk of planet building blocks ? could survive inthis environment. The answer appears to be yes, at least under certainconditions, such as a specific range of gas densities and star orientations.And in the specific case of Alpha Centauri B (CenB), one of two binary stars inthe system AlphaCentauri, these conditions are right. The system is about 4.2 light-yearsaway. "It is quite possible that a habitable Earth-likeplanet may be hidden around CenB," the researchers ? Jilin Zhou andJiwei Xie of China's Nanjing University and Jian Ge of the University ofFlorida in Gainesville ? wrote in a paper recently submitted to theAstrophysical Journal. The scientists built a computer model to test the birth ofbaby solar systems around binary stars. They were able to alter startingconditions such as the arrangement of the parent stars, and the amount of gasin the system. They then ran their simulations over a multitude of conditionsto discover which factors would lead to a disk of planetary embryos formingbetween 0.5 to 2.5 times the distance between the Earth and the sun ? roughlythe zone in which a terrestrial planet might be habitable. The researchers also tested the case of Alpha Centauri B. This star is just a bit smaller than our own sun, at about0.93 times the sun's mass. Its partner, Alpha Centauri A, weighs about 1.1times the sun's mass. They are the closest stars to the sun after their smallercompanion Proxima Centauri. Although no extrasolarplanets have yet been discovered around any of these stars, Alpha CentauriB in particular is thought to be a prime candidate for hosting an Earth-likeplanet in or near its habitable zone. The results are "encouraging" for the case ofAlpha Centauri B, the scientists said. "Although planetesimal accretion in CenB issignificantly less efficient and slowed-down as compared to single starsystems, it is still possible," they wrote.